It’s finally done! 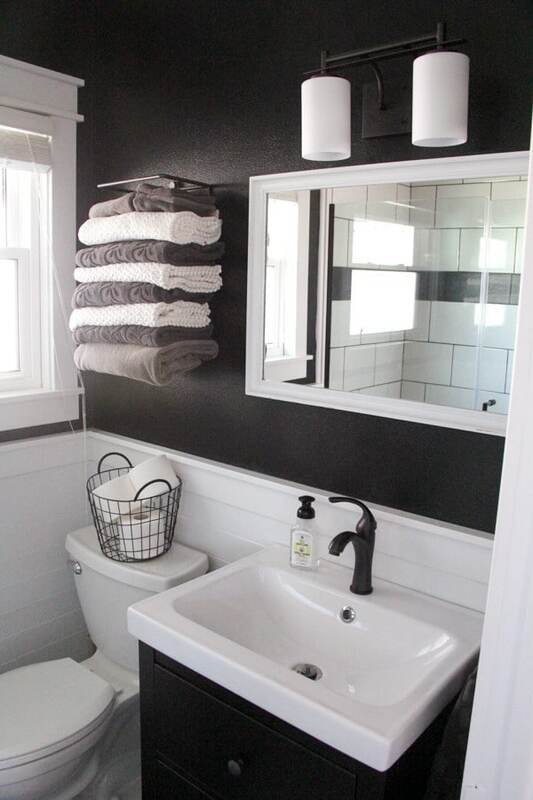 Our bathroom took a ton of work, but came together even better than I hoped when I created my bathroom mood board. 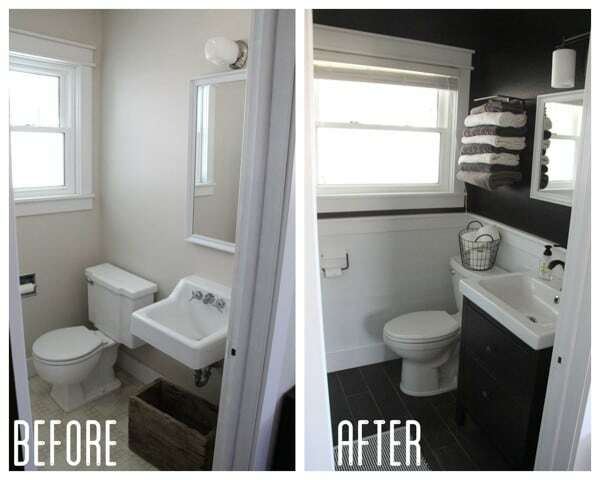 Today I present to you our Modern Industrial Bathroom Reveal! I’ll warn you, this is an extremely picture-heavy post, but how could it not be with a bathroom this beautiful? 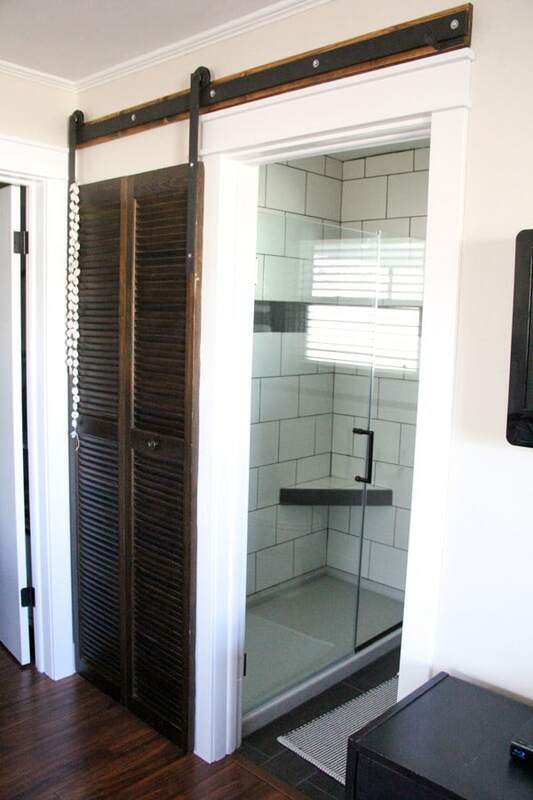 The industrial barn door that we built last year is the perfect preview to the industrial vibe on the inside of the bathroom. 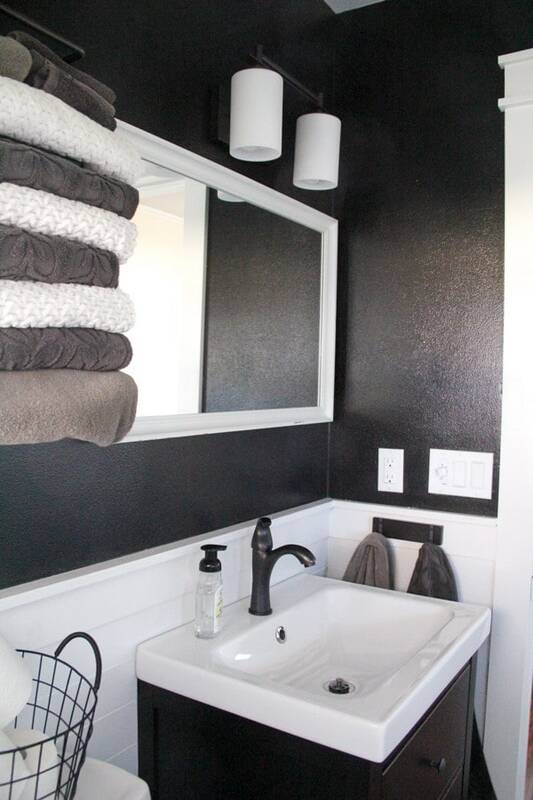 Painting the walls black was a little bit of a scary move, but with the white planked walls I just love it. 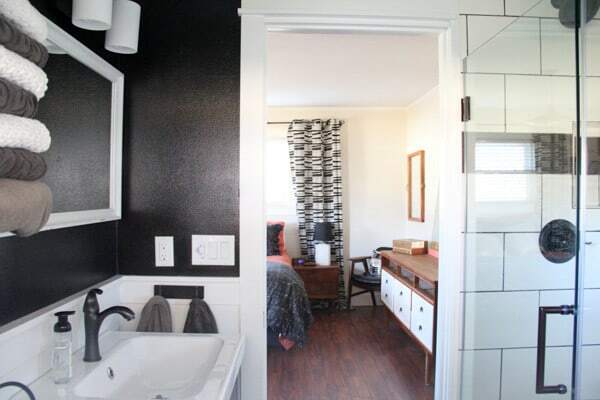 All the black and white also ties in wonderfully with our Mid Century Master Bedroom. Tiling the shower was a HUGE job. 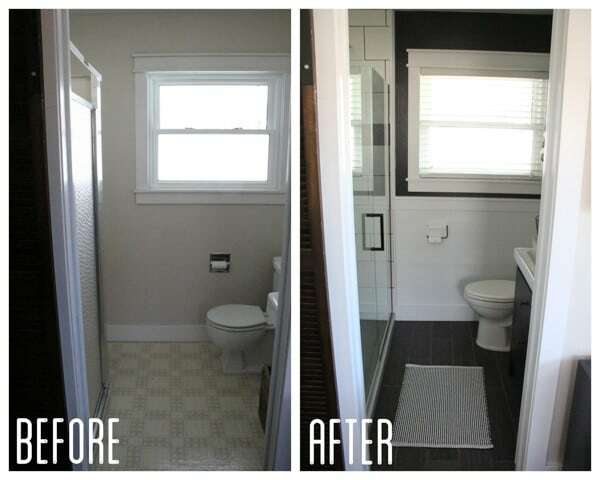 I just went with 9×12 white porcelain tiles, and then accented them with a strip of the tile that we used on the floor. The glass doors were also insanely difficult. Between trying to level them, drill into our brand new tile job, and exchange our first set for a set 1/4″ smaller. Let’s just say we’ll probably never install glass shower doors ourselves again. 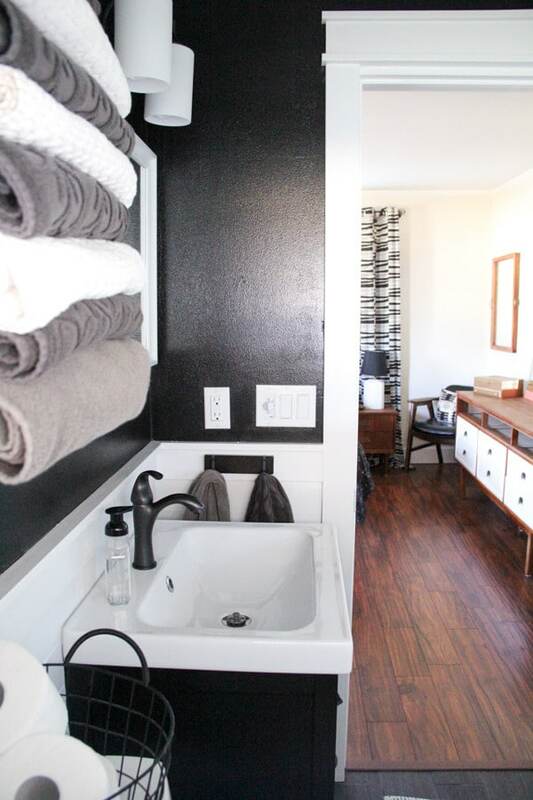 But that dark grout… isn’t it dramatic and wonderful? I’m so glad we ended up going dark. Although it DOES amplify imperfections, it is worth it. 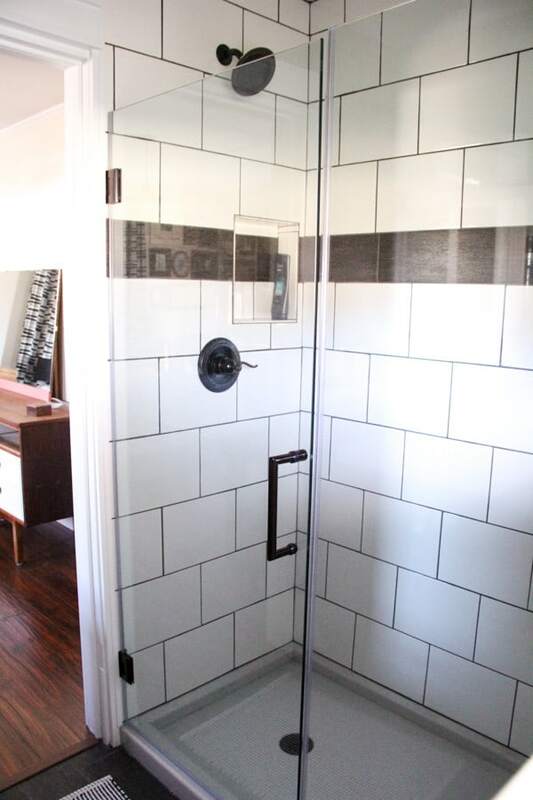 We also hung the shower head extra high for my 6’4″ hubby. 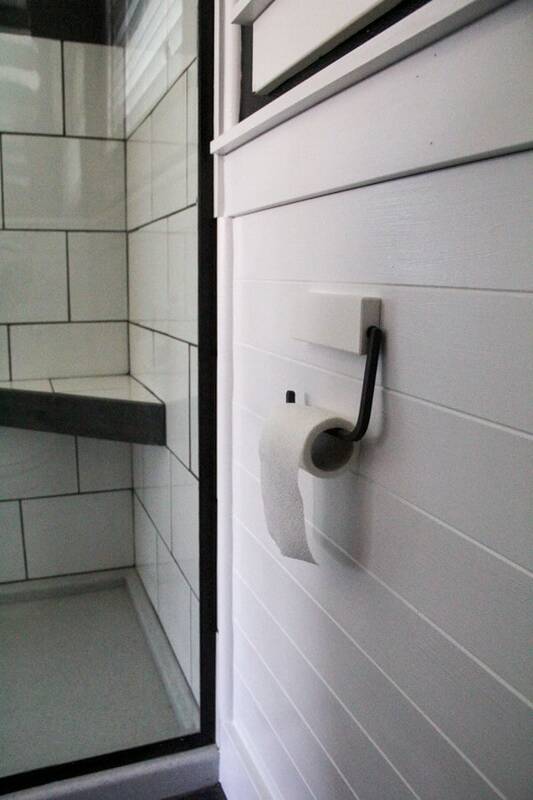 We went with this little ikea toilet paper holder to replace the vintage in-wall version. 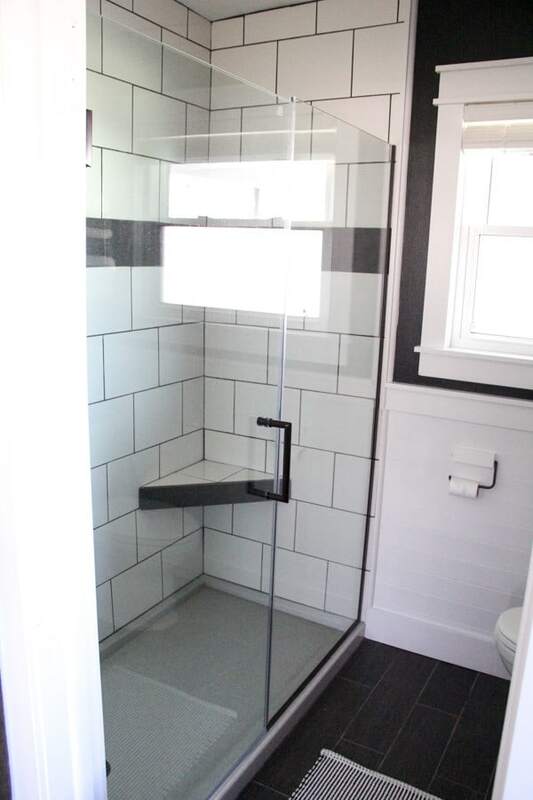 You can see a glimpse of our shower seat too. Really I don’t think it will be used as a seat much, but more a footrest for leg shaving, and maybe an extra spot for a bottle of shampoo. 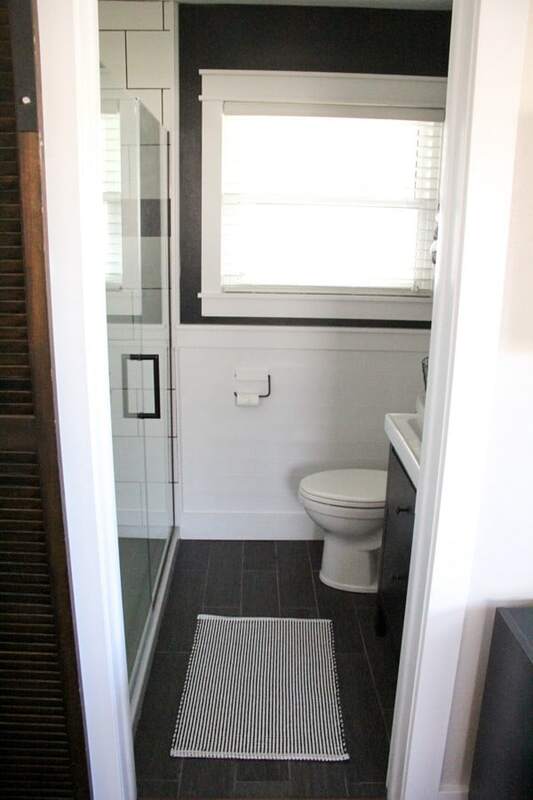 Even though this bathroom is pretty small, the glass doors and large mirror help it to feel much larger. I’ve been on the hunt for the perfect mirror, but this one that I already had is working well as a stand in until I find the right one. This wall mounted towel rack from Crate & Barrel adds necessary storage, but also adds to the industrial vibe. This is the light, and the faucet that we went with. Neither are showstoppers, but they suit the space well. The vanity is the Ikea Hemnes with the Odensvik top. 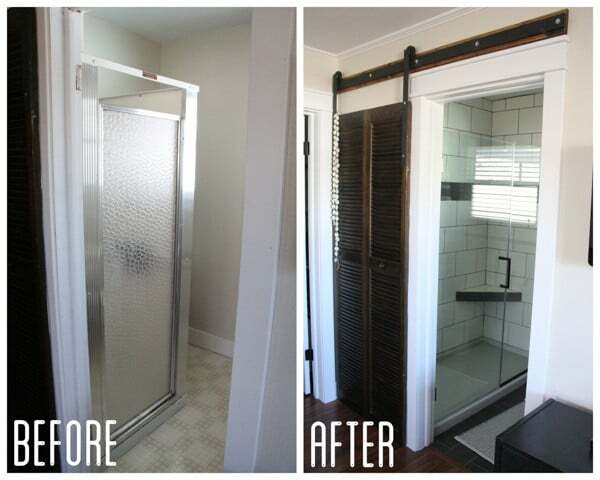 This little bathroom has come a LONG ways from it’s tiny little “durastall” steel shower! It’s vintage light and wall mount vanity were cute, but just not functional. Now we’ve got a very functional and stylish bathroom. See how I re-used that same mirror from the original space? There she is… still tiny, but with much more character and function. As much as I love our new little bathroom I’d like to stay away from tiling for a while after this one! So what do you think? Do you love the black like I do or is it a bit on the dark side for you? 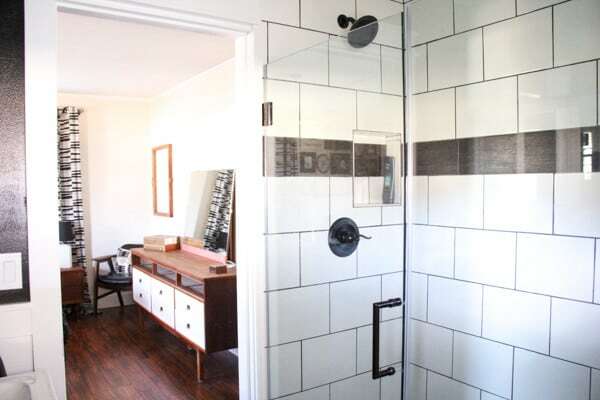 Do you love open glass showers, or would you prefer more privacy while you shower? Hopefully this space is inspiring in one way or another and gives you some ideas for your own space! Wow! 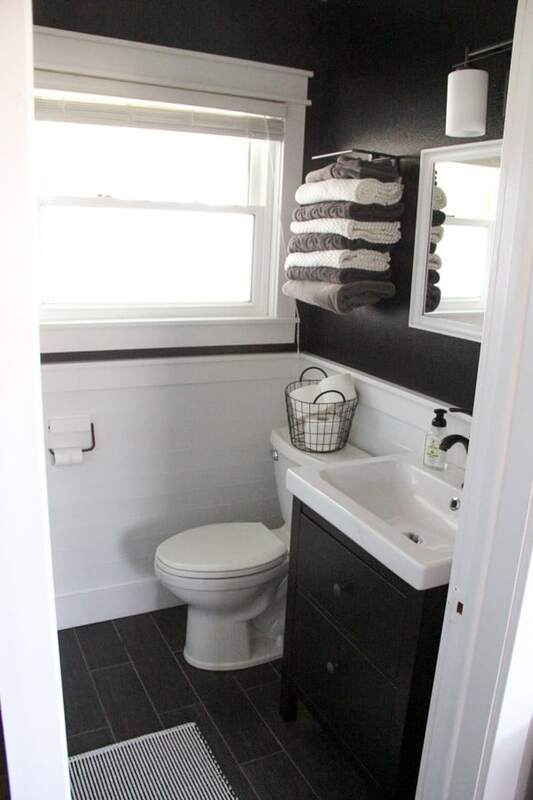 beautiful little bathroom! Curious about the light you used, it would be perfect in our bathroom and is inexpensive… For the price, does it look pretty nice in person, and I also noticed you turned it upside down from the way it is shown on Amazon. Did you have to do anything to make the glass stay? Doesn’t mention the option of using it that way in the description. The glass gets screwed on so it can go either direction. I didn’t even realize I flipped it! 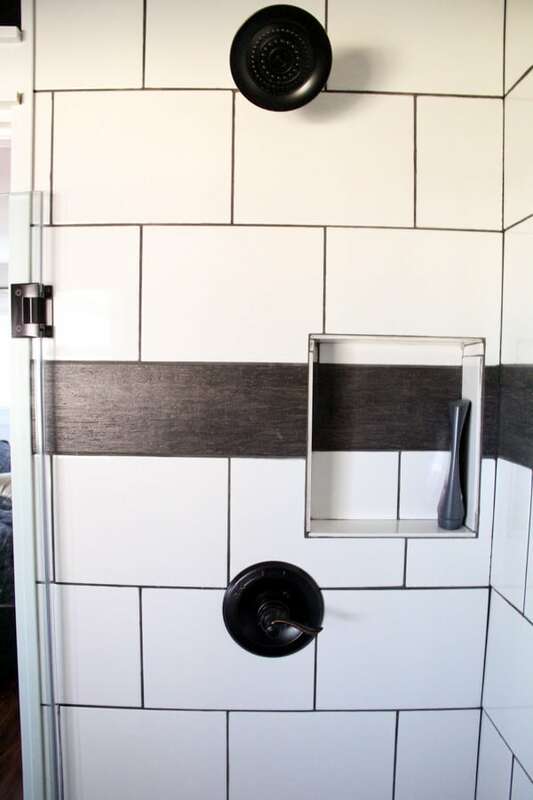 What color grout did you use for the shower? I believe it was called charcoal. It was a step down from the darkest black.